Only one of the two forewords I’ve written is actually for a real book. 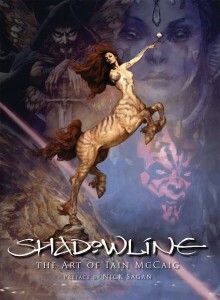 That would be Shadowline by the brilliant Iain McCaig. You can order it from Amazon here. What is Shadowline? It is the place where things meet: light and shadows, hope and despair, good and evil. It is, to me, the most interesting place to hunt for stories.” So begins this stunningly realized and beautifully rendered new work from master storyteller and artist Iain McCaig. McCaig is best known for his work as a principal designer on the three Star Wars prequels, including the iconic characters Queen Amidala and Darth Maul, as well as his work on many major motion pictures, television, and video games. His work can be seen in such acclaimed films as Terminator 2, Hook, Francis Ford Coppola’s Dracula, Interview with a Vampire, and Harry Potter and the Goblet of Fire. Shadowline presents a stunning portfolio of more than two decades of McCaig’s masterful concept designs and storyboards, cover art and illustrations, as well as his private sketchbooks and personal paintings, all woven together within the confines of an engrossing, otherworldly tale. 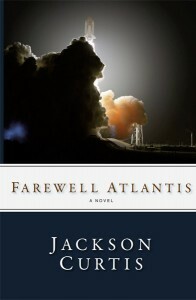 Farewell Atlantis is the science fiction novel that John Cusack’s character is said to have written in the movie 2012. No one had ever asked me to write a foreword for a fictional (as in non-existent) book before, which made it a strange and fun project to undertake. You can read what I wrote and find out more on the Farewell Atlantis website. Curtis’s epic novel blends equal parts classic thriller and provocative spiritual speculation. Full of larger-than-life characters whose growth over the course of the novel interweave seamless with the plot and a sharp, witty edge of humor, Farewell Atlantis is an action-packed novel that intrigues philosophers and scientists alike. This highly acclaimed first novel is splendid entertainment and refreshingly forthright. Farewell Atlantis is a large sprawling tale of conspiracy, politics and ideology. With his thorough research and lucid writing style, Curtis explores the apocalyptic realm through the complementary lens of science and art, and presents a bold exploration of the human spirit. The novel aims to educate readers on reclaiming their birthright as owners of the planet rather than victims or subjects to the political, education and economic machinery while awakening them to a higher global evolution of consciousness. As the story unfolds, Curtis delves into the lost knowledge of the ‘ancient ones,’ sacred sites, shamans and interdimensional worlds. He blends the events of many years throughout history with the events of today and the conspiracy theories into a story of tomorrow. An intricate plot, skilled narrative technique and well developed characters make this a novel most readers will find absorbing and comprehensible.